Hannah Jane is on her way! 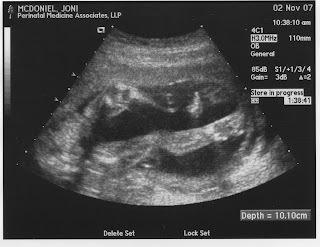 Our doctor's visit last week revealed all is well, and we have a girl in there! 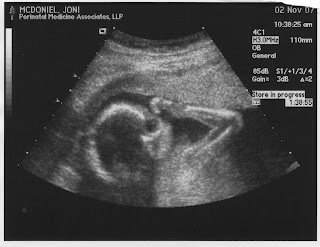 The "Level 2" sonogram was able to show details we have not seen before. From counting fingers to brain size, Hannah is perfect. In the picture to the left, she is scratching her face. She happened to scratch right as the camera was on her, so we got to see that as well. In the picture to the right, she is showing off her long, "Sneed" legs. I know they are from Joni's side (Sneed) because my family is not where the tall genes come from! Her left leg is bent at the knee, and her right leg is stretched out. The doctor said that all is well, and she is a bit ahead of schedule in terms of size. We are so excited, and we've finally got the nursery cleaned out so that we can get to the walls to paint. Joni has chosen "Ladybugs" as the theme, and I know it will be as cute as can be. We go back in a month or so, and I'll try to update here more often. The past few weeks have been insane, and we have other big news to post...but I won't steal Hannah's thunder.